Latin for 'curved or hooked', referring to the inflorescence. Artanthe adunca forma angustifolia Miq. Artanthe elongata forma brasiliensis Miq. Artanthe elongata forma glabrior Miq. Piper cumbricola var. montevagum Trel. Piper elongatum var. laevifolium (C.DC.) Trel. Piper intersitum var. porcecitense Trel. Piper martinicense var. montis-pilati C.DC. Piper oblanceolatum. var. fragilicaule Trel. Shrub up to 6 m tall and 7 cm dbh. Stipules ca. 23 mm long, leaving circular scar around the twigs. Leaves alternate, simple, penni-veined, hairy, leaf base asymmetrical. Flowers ca. 1 mm diameter, green-yellowish, placed in catkin like, elongate inflorescences. Fruits ca. 1 mm diameter, yellow-blackish, drupes. Originally from the Neotropics, but escaped in Borneo. Usually in severely disturbed habitats and along roads. 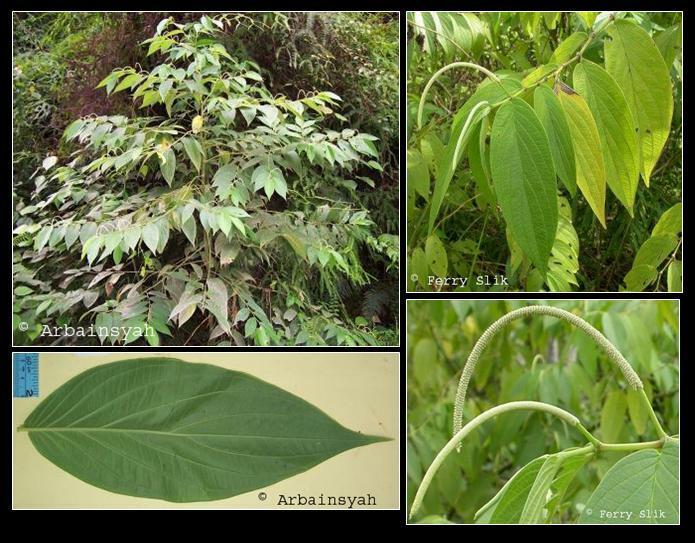 Originally Neotropical, but currently also in tropical Asia due to its invasive capacity.